Tropical Storm Karl has formed in the far eastern Atlantic but currently poses no threat to land. 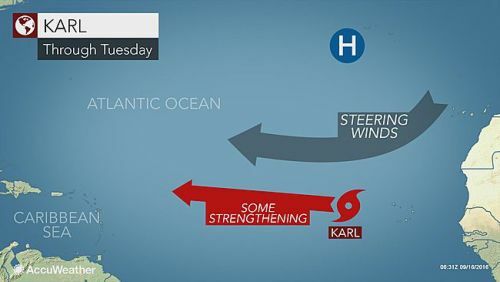 Late Thursday night, Karl was located about 575 miles (930 km) west-northwest of the Cabo Verde Islands and about 1,930 miles (3,105 km) east of the Leeward Islands. The National Hurricane Center in Miami says Karl is moving west at 14 mph (kph) with maximum sustained winds of 45 mph (75 kph). It was expected to continue toward the west or west-southwest for the next couple of days. No coastal watches or warnings are in effect related to the storm.